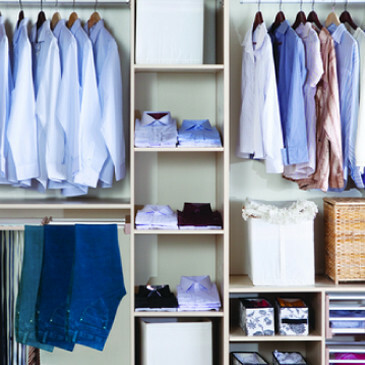 Dark, damp and humid closets can be breeding grounds for mold. Mold frequently collects in carpeting or drywall at the back of closets, and can spread to clothing or packed items. 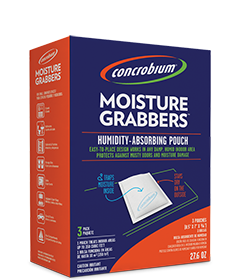 Use Concrobium to eliminate mold on interior walls, flooring and clothing. Spray the affected area with Concrobium Mold Control. Allow to dry completely. As it dries, the solution forms a film that crushes and eliminates the underlying mold spores. Clean the surface with a Concrobium-dampened cloth or brush. If mold residue remains, paint the surface or take other cosmetic steps as required. 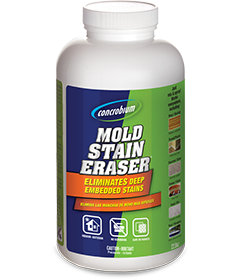 Try our Concrobium Mold Stain Eraser for tough and embedded mold staining. 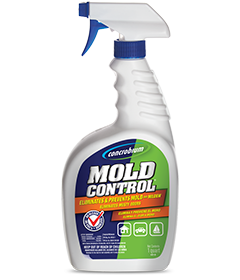 As a final step, reapply Concrobium Mold Control to help resist re-infestation. Tip: Address the moisture source to solve the mold issue; dry damp clothing and equipment prior to storage; fix any leaks behind walls and ensure relative humidity in the area is no higher than 50%.